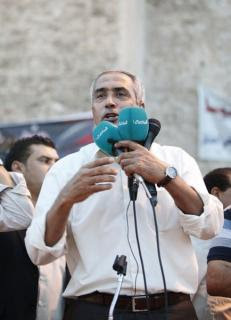 Omar al-Hasi speaks to the crowd during a rally supporting “Fajr Libya” (Libyan Dawn), a group of [Islamist] forces mainly from Misrata, at Martyrs’ Square in Tripoli September 19, 2014. (Reuters) – Libya’s self-declared prime minister, who runs a rival government not recognized by the international community, met a Turkish envoy on Tuesday, in the first publicly known diplomatic meeting with a foreign representative. Western powers and Libya’s neighbors worry the conflict will turn the North African country into a failed state or even spark civil war as former rebels who helped oust Muammar Gaddafi in 2011 now fight for control. Hasi met Turkey’s special envoy for Libya, Emrullah Isler, in Tripoli, Hasi’s government said on its website. It showed a picture of the meeting in the prime minister’s office, which had been previously used by Thinni. The United Nations and Western powers have tried to bring both sides to the negotiating table to end the country’s chaos but have avoided recognizing or dealing publicly with Hasi, who was elected by the rival assembly in Tripoli. No surprise that interfering, batsh*t crazy Islamist Turkish government representatives met him. Our ally in NATO.